•Heavy duty raised & hooded D-shafts knobs and pots for rust prevention. The Little Brother to the Industry Standard for Fitness - We took the best built, best sounding, easiest to use mixer on the market the Aeromix 2+2 DC Mixer, and built the basic feature set into a smaller 1/2 rack space version. The Aeromix Mini has a limited number of knobs, yet gives instructors the ability to adjust the tone quality (bass & treble) of the microphone independently from the music tone. This allows instructors to adjust any feedback issues out of the microphone mix without effecting the music quality. The Aeromix Mini is easy to reset on the fly if instructors have sound issues, preventing costly and timely service calls. 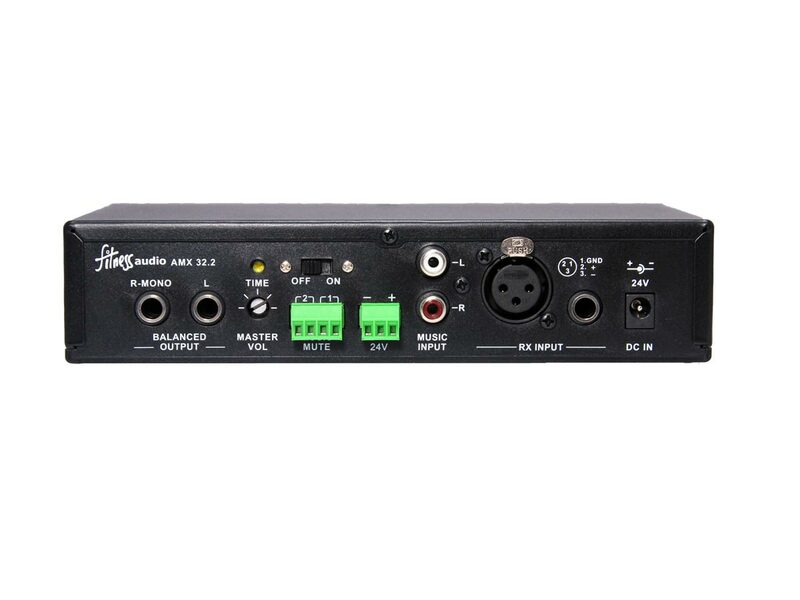 There is a front panel i-Jax input for the latest brands of MP3 players, eliminating the possibility of eager instructors digging in the back of the sound system for an auxiliary input jack. Using an auto-sensing circuit, the Aeromix knows when you plug an MP3 player in the front of the unit and switches the source control for Music 1 to the front input. Linking your Aeromix Mini to the Trigger to monitor room volume and for ‘Audio Slapping’ instructors (15 db music ducking for a management determined amount of time 2 - 60 seconds) that insist on playing the system too loud. For initial set-up, the Aeromix Mini has a hidden Master Volume on the back of the unit to preset the room master volume. The Aeromix Mini was road tested and QC’d by the Aeromic Lab Team for optimal sound quality (clean highs, punchy bass, no low volume hiss) when used with Aeromics, Cyclemics, and E mic microphones and Fitness Audio brand mic systems. Other mixers make promises on features but don’t deliver on sound quality - for the best results go with the best! The Aeromix Mini can be rack mounted with an optional rack mount kit - you can also rack mount it side by side with either a Fitness Audio Wireless Mic Receiver or AeroLink Bluetooth Music Receiver. 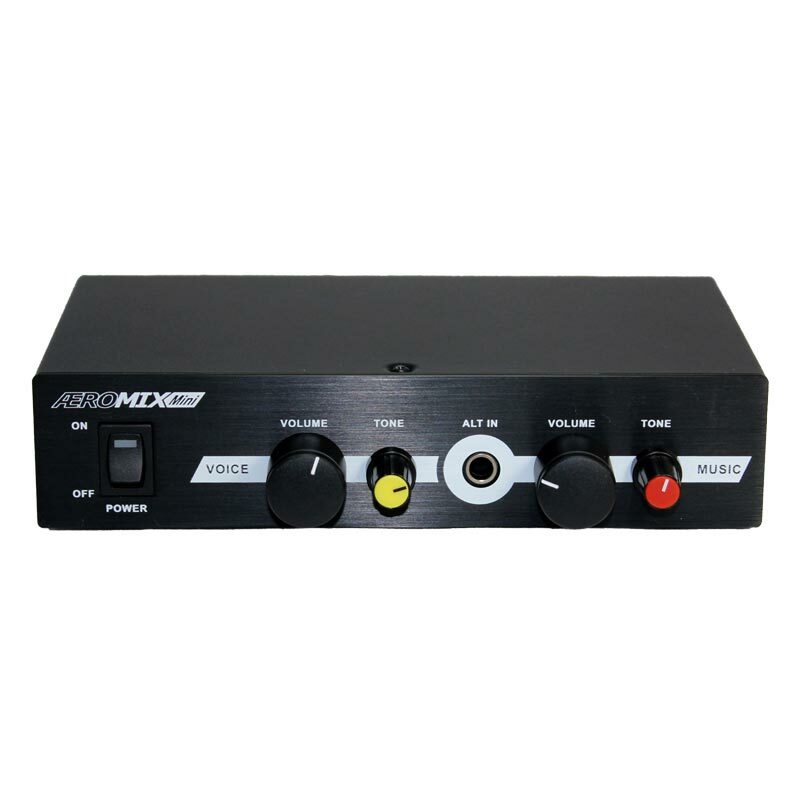 The ultimate fitness mixer 2 mic inputs (with bass & treble adjustment), 2 music inputs (with bass & treble adjustment), iJax for MP3 players, hidden master volume control, Trigger link for Audio Slap 15 db music ducking, 1 pairs of outputs.